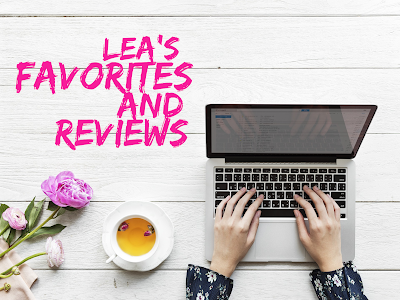 It's been a while since I did my favorites and reviews. So, today will share a few of my recent favorites and maybe they'll soon be your favorite as well. 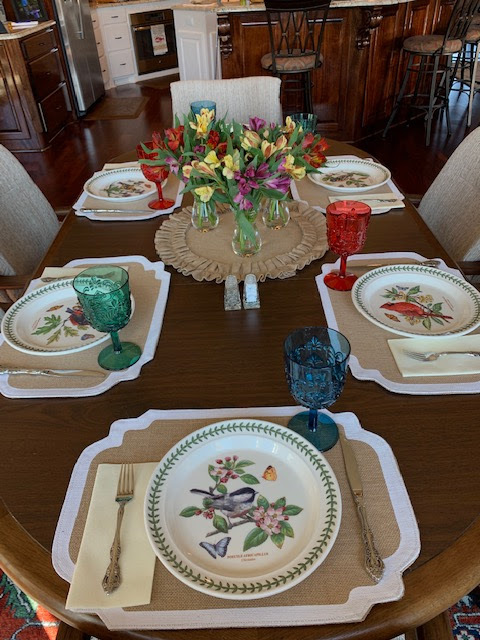 We had dinner guests recently and I thought my table setting was so pretty for a most casual affair. I am no flower arranger but Alstroemeria Lillies make such a pretty bouquet just placed in a vase. It doesn't really take any arranging and I can manage them. And, they come in such great colors and they last for such a long time. I love my Botanical Gardens Birds by Portmerion dishes and they make such a pretty table. 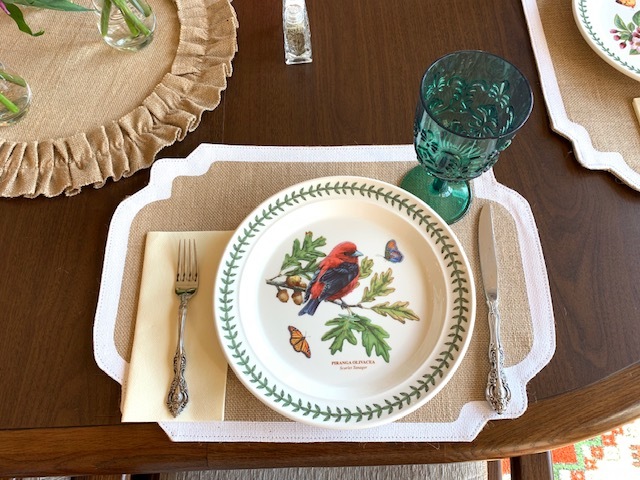 They can be dressed up or down and I dressed them down with these burlap placemats for this dinner. Entertaining is a favorite of mine and generally my entertaining is more on the casual side. I rather concentrate more on the fun and fellowship of the gathering than the "fancyness" of the affair. 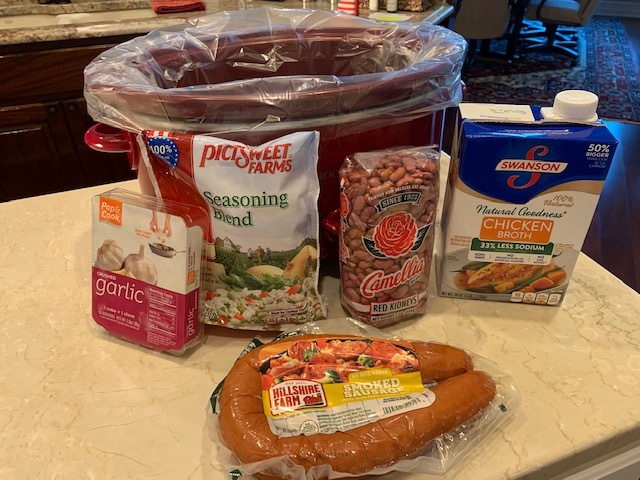 One of our favorite meals for this time of year is Crockpot Red Beans and Rice. I found this recipe last year and it's the best we've ever had. I don't believe in chopping onions, bell pepper and celery so I just buy the Seasoning Blend and use it instead. There are many recipes for this so just Google and take your pick but I highly suggest that you use Chicken Broth instead of water. It makes it so much better and I always use the low sodium. If you like Red Beans and Rice you need to make it in the crock pot. It's soooo easy and soooo good! Click here for the recipe. I've been seeing the monogramed duck boots and decided that I really needed wanted a pair. So, I order some and I think they are so cute. I haven't tied the knots in the strings yet but I will do that shortly. We're going to Oklahoma in a few days and I think they will be perfect to wear to Clancy's sheep show. I ordered these from Marleylilly They have so many cute monogramed items. They are a favorite website of mine. Have you ever heard of Snoozies? Well, I saw them in a store about 3 months ago and bought a pair and then went back and bought another pair. The pair pictured above are called "Skinnies." They are very thin and more or less just a covering for the foot. And, that's pretty much all I want, just something to cover my feet. I do not go barefooted EVER!!!! These are called "Furries" and are a whole lot thicker and warmer. So, you have two choices and they wash beautifully. I don't know how long they have been around but I'm so glad that I found them as they are my most favorite house shoe. 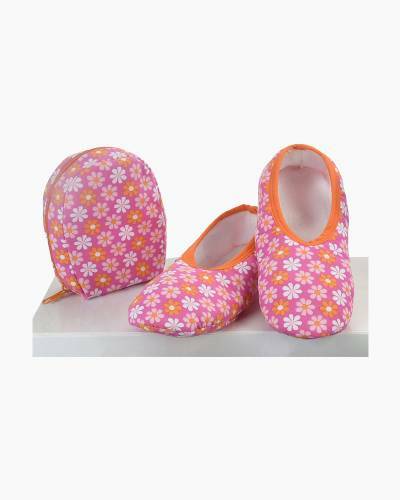 They have nice gripper bottoms too and they come in such fun prints. And, you can order them from Amazon if you do not have a place local to get them. 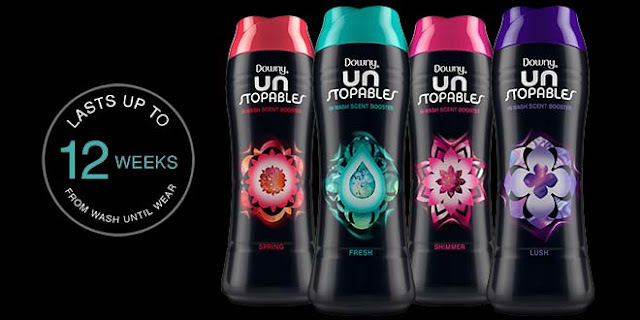 Perhaps you are already familiar with Downy Unstopables. I had never heard of them until about 2 weeks ago and a couple of friends told me about them. I immediately picked up a container and am now a "happy user" of them. I bought the "fresh" scent and all our laundry smells so good. It is not a softner, just a scent booster. And, a little goes a long ways, just sprinkle a few pellets in the bottom of the washer before putting the laundry in. The smell is definitely not over powering, just very pleasant. It's my new laundry favorite! Okay, there you have it, a few of my favorites. Have a great weekend! I love to see people's favorites and have found a couple of new favorites for myself following blog authors' advice. Have not heard of the Downy booster! Your table looks lovely! Yay! You ordered some duck boots! Love them! We're Twinkies! And yes, they will be perfect for the sheep show! 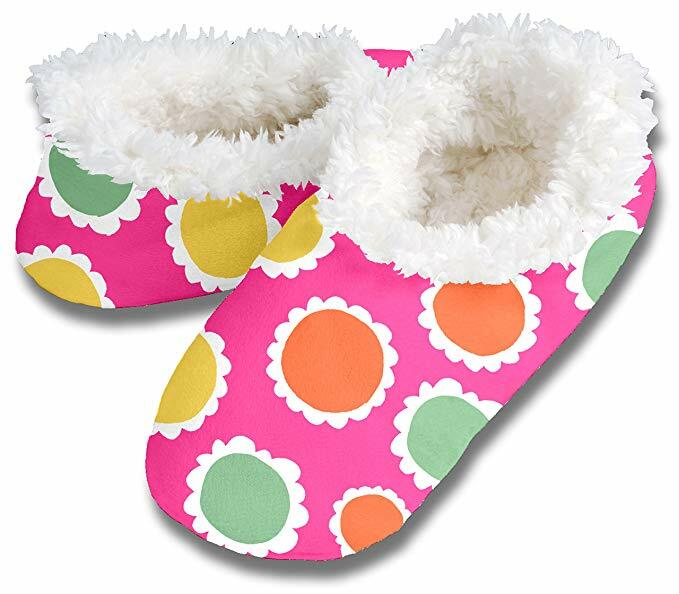 I'm going to have to get me a pair of those cute snoozies!! Have a great weekend, Lea. I always enjoy your favorites:) I love the snoozies, I have a pair of those. My Granddaughters got duck boots for Christmas. I know they will be warm for your trip! Beautiful table setting, love the flowers! Have a beautiful day dear friend, HUGS! The monogrammed boots are so cute...great find! I'm clicking over to check out the red beans and rice recipe. My husband would love that. Have a wonderful weekend! I love that you set the table so pretty! I really do think it makes a guest feel super special. Those slippers look so warm! I love the monogrammed boots! Thanks for the link! Have a great weekend! Love all your favorites...going to look into some of them. And your table setting was just lovely. Now I have a question and also a HUGE FAVOR to ask!!! I noticed at the top of your blog it has Google+. I had a notification that Google+ was going away and that I evidently have an account! I don't even know what Google+ is!!!! My favor is: can you explain it to me??? My blog is with blogspot.com and I am terrified that when Google+ goes away in April my blog will vanish, but I have no clue in how to "save" it!!! I would so very much appreciate any help you could give me. You can email me. cherischatter@yahoo. THANK YOU! Yes, a beautiful setting for sure! I love the boots. Thanks for the review on the UN Stopables, I'll have to try it. 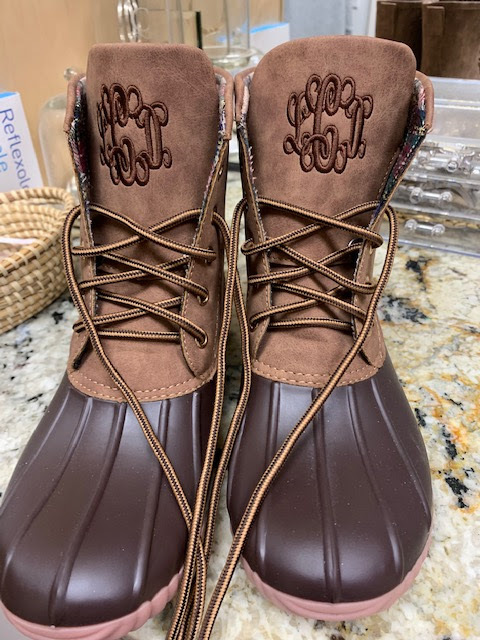 Monogrammed duck boots. Now I've seen it all. Very nice!